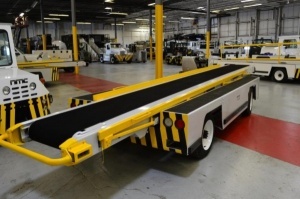 Global GSE stocks a variety of aircraft belt loaders for both narrow and wide body aircraft. If you do not see what you need here, please contact us as we have new stock arriving weekly. Used 1990 NMC Wollard TC886 DL Diesel Aircraft Belt Loader is in good condition. Service height 42- 167-inches. Meter reads 6,999 hours of service. Used AMSS TC-888 diesel aircraft belt loader. The service reach is 30 to 173- inches. Freshly painted. Used 1999 Tug 660 Diesel Aircraft Belt Loader has a conveyor length of 294 inches and is capable of widebody service with its reach of 40- 170 inches. Meter reads 5,848 hours of service. Freshly painted. Used Tug 660 gasoline belt loader has a conveyor length of 294 inches and is capable of widebody service with its reach of 40- 170 inches. Freshly painted.